I admire Adam Savage, one of the hosts of Mythbusters. Adam and I are about the same age and share some of the same interests – for instance, we both took up juggling as teens. Now that Mythbusters is off the air Adam has time to explore this wonderful San Francisco area, and what better way to do it than by bike? It looks like somewhere in the fourteen seasons of Mythbusters Adam got in shape and started exercising. I think he’d enjoy cycling. There are a lot of good bikes available for sale but I thought it would be more fun to build a bike for Adam from spare parts in true Mythbusters fashion. 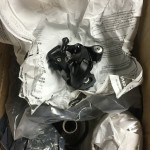 Building a bike is more about assembling parts than about fabricating anything, and bike assembly is becoming rare in this era of integrated systems and proprietary standards. In all I spent about $1000 on this build – $400 for the frame, $500 for the gruppo, and about $100 on miscellaneous bits and pieces that I needed to round out the bike. T he frame is a generic carbon fiber from Bike Nashbar, which allowed me to have no branding or stickers except those that I chose. The gruppo (set of parts parts) is Shimano 105, which works great and isn’t expensive. 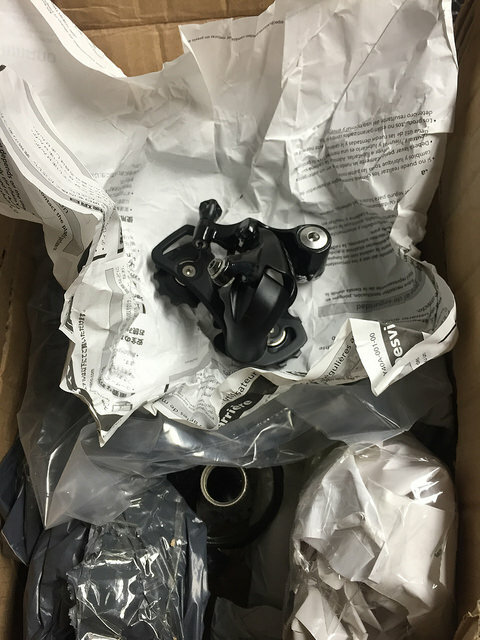 I ordered the gruppo from Amazon.com and it came, as usual, from deep within the gray market, stripped off some unsold complete bike. 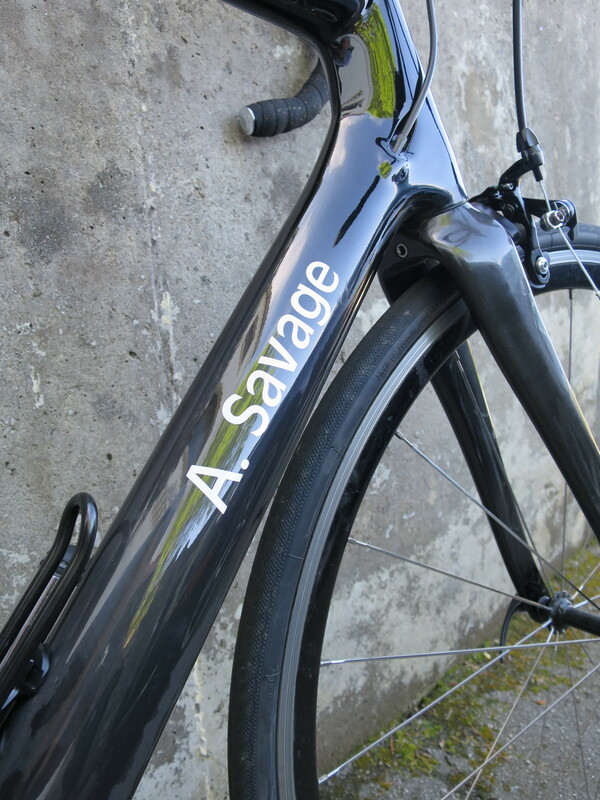 It’s maddening the way component companies thwart the do-it-yourself cyclist by jacking up aftermarket prices and charging OEMs so much less, giving rise to this zany gray market. The worst part by far is the front derailleur. The bike is drilled for internal cable routing but the placement is finicky, especially since I pressed in the bottom bracket before cabling the bike (a natural thing to do but wrong in this case). The bottom bracket didn’t want to come out and the cables didn’t want to be routed around it, so I just ran the front derailleur cable around the exterior of the bottom bracket and protected the frame with some cable liner. It’s a bit of a kluge but it works. I installed Shimano dual-sided flat/SPD pedals so that Adam can ride the bike in sneakers or regular shoes until he feels comfortable using cycling shoes. The best part is the decal. I think it’s cool and understated to have your own name on the frame, so I chose “A. 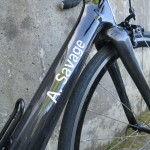 Savage” for the downtube. 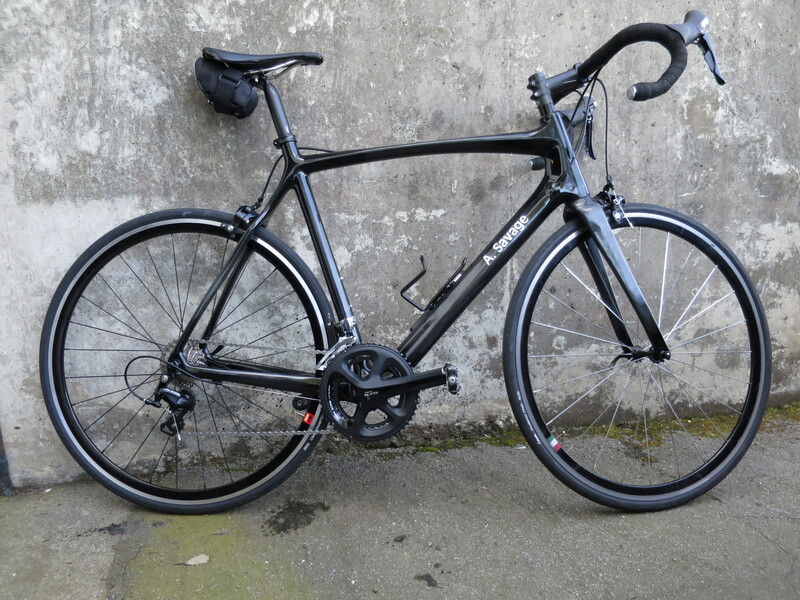 Now I’ve just got to find some way to get this bike to Adam, along with some basic tools and a floor pump. Maybe I’ll just drop it off at the Tested studios. Enjoy it, Adam!